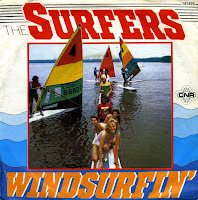 In 1978, Windsurfing was the world's new big thing. Dutch producer Jaap Eggermont decided to write a song about it. It was to be performed by members of the group Catapult, who just started a side project Rubberen Robbie. The song was not suitable for that group, and so The Surfers were thought up. Nico Fontijn, Paul Braaksma, Iwan Groeneveld, Patrick Elalouf and backing singers Esther Overbeek, Marijke Meyer and Cathy Leonupun were brought together to perform the song during TV programmes and live performances, while the studio version was recorded by members of Breeze and The Internationals. The song became a number 2 hit in Belgium and the Netherlands. The success of the group proved to be short-lived. Esther Overbeek continued as a member of the Dolly Dots, other members disappeared into obscurity after The Surfers folded in 1980.